What is the countertop material/color? - looking for the material on the sink side (not the island). Thanks ! Hard to tell but looks like a quartz. Silestone? Yes, this is a quartz, it's Caesarstone, polished Lagos Blue. I like the orientation of the kitchen to the kitchen nook! - Are there other images or a floor plan showing how the kitchen and kitchen nook are oriented to the rest of the house and other rooms? Thank you! We have a few additional images of this kitchen - have a look under the "This Old House - West Newton Hill" project! Thank you for responding so quickly. I did see the other images but was hoping to see views from around and past the kitchen nook - either back toward the kitchen or toward any living area beyond the kitchen nook. Even a floor plan would be terrific. Try Benjamin Moore's Feather Bed. The finish is a custom antigue white paint with a brown glaze. I'm sure your local cabinet maker can work with you to achieve the perfect color for your home! Good luck! What is the composition of the island surface material? I'm not sure, but it really looks like wood to me. The wood top is an end grain burmese teak with a super double roman ogee edge from Grothouse Lumber! How hard is butcher block to keep up? The wood stop will be maintained by you, the client. This top was sourced from Grothouse, and you can see their instructions for maintaining an end grain top. 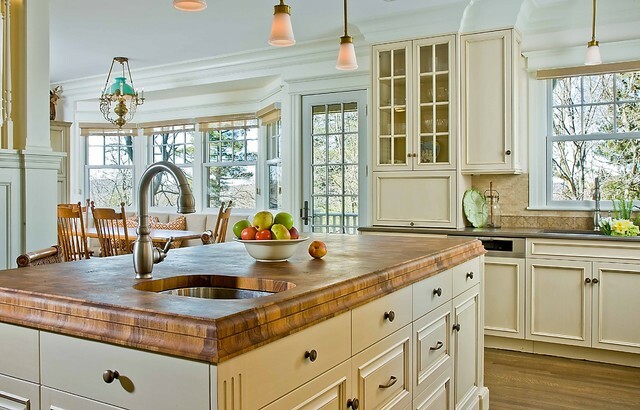 Butcher block island - Hello, curious how you made the island with the magnificent butcher block top? The cabinets below the island top and the butcher block top are two separate entities. The base cabinets were installed first and the wood top secured after. The cabinets were designed by us here at Venegas and Company and the wood top was built by Grothouse Lumber. (www.glumber.com). Hardware - Who makes the hardware? Beautiful kitchen! Who makes those pendant lights? Thank you for your inquiry! This fixture was sourced by the interior designer, but have a look at the Chatham Pendant by Hudson Valley. It is a similar fixture and you can also look at the other pendant fixtures they offer. Good luck! Is there a glaze on cabinets? Yes there is. You have a good eye. It is a very delicate glaze with minimal hang up. The lighting was sourced by the interior designer and unfortunately I do not have further information. I wish I could be more helpful. Cutting board island with fancy edge? ?